Nishiazabu , very, close to Roppongi, is a special area with a chic atmosphere. 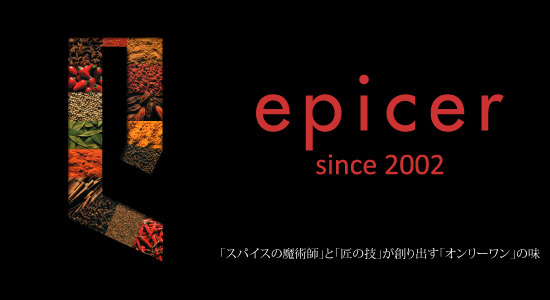 “epicer” is there, in Nishiazabu like a quiet hiding placer for adults. and the master of craftsmanship,, with beautiful wine. The dish presented like a French cuisine will surely delight your eyes and tongue. fixed concept of Chinese food. so, our wine list will surely amaze our guests, especially wine lovers. important moments or occasions in your life. 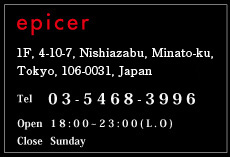 The accommodation is from 2～14 persons. We hope you will make use of them with delicious wine and food. We have partly remodeled inside of the shop. in a chic and romantic atomosphere. We would like to welcome you to our restaurant! Here is the link for our business tie-up shop "suite space Hug"